A very rare profile of Paddy by the BBC. Barely anything is available on the BBC about one our greatest Englishmen. Since his death the amount has increased with an obituary and the serialisation of Artemis Cooper’s biography. This review is welcome. Abducting a General: The Kreipe Operation and Soe in Crete is a new account of the kidnap of a German general in WW2 from occupied Crete and sheds light on one of the 20th Century’s most interesting men. “One man in his time plays many parts,” wrote Shakespeare in As You Like it. If that is any measure, then the late Sir Patrick Leigh Fermor blew it into a cocked hat. A decorated war hero, brilliant conversationalist, historian, Hollywood scriptwriter, perhaps the finest travel writer of his generation – the list of the achievements of Paddy, he was never called Patrick, goes on and on. 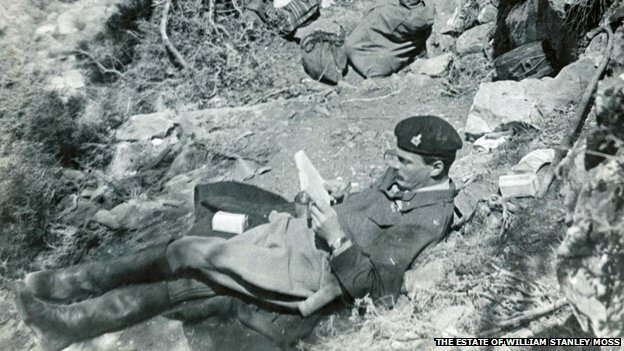 And now, three years after his death at the age of 96, Leigh Fermor’s own account of the audacious wartime exploit, capturing General Heinrich Kreipe, the commander of a division on the island of Crete, evading his pursuers and getting him to Cairo, has been published, further gilding his glittering reputation. He recalls how he and his colleague W Stanley “Billy” Moss dressed as German corporals, flagged down the general’s car on an isolated road. Their Cretan comrades helped them overwhelm the driver and, with Fermor wearing the general’s braided cap in the front of the staff car, they negotiated 22 German checkpoints with their quarry out of sight in the back. On the journey to a rendezvous with a British submarine the party traversed the island’s highest point, Mount Ida, where Fermor and the general traded some lines of Latin from Horace. It was, he explained later, “as if the war had come to an end, because we had drunk of the same fountains. Everything was very different afterwards”. Fermor was awarded the Distinguished Service Order, while Moss, who penned his own account of the incident, Ill Met By Moonlight, later to be made into a movie starring Dirk Bogarde, was given the Military Cross. But this was but one achievement by the man once described as “a cross between Indiana Jones, Graham Greene and James Bond”. At just 18, the wild and wilful son of distant parents, Fermor had been “sacked” from a series of schools before being taken in by the bright and bookish denizens of bohemian London. He started a journey. “Hopeless, idle, easily distracted, unemployable,” as his biographer and friend Artemis Cooper puts it, Fermor resolved to travel on foot from the Hook of Holland to Istanbul living on just £5 a month – part wandering scholar, part tramp, in order to reboot his life. His journey, chronicled between 1977 and last year in three books – A Time of Gifts, Between the Woods and the Water and The Broken Road – is a poetic and romanticised evocation of a Europe as much of the mind as of reality, one which was swept away by WW2 and the upheavals which came in its wake. Through Holland he wandered, then followed the Rhine through German cities like Cologne, where “salients of carved eagles and lions and swans swung from convoluted iron brackets along a maze of lanes,” and Coblenz, remarking that “the accent had changed and wine cellars had taken the place of beer-halls”. This was a Germany in the first year of the Nazi regime with people giving the “Heil Hitler!” greeting “as though the place were full of slightly sinister boy scouts”. In the midst of this, though, Fermor’s descriptions are lyrical, cultural, rarely political. His charm eased his passage. One day he might sleep in a barn, the next in the palace of former Austro-Hungarian nobility, playing polo on bicycles in the grounds. 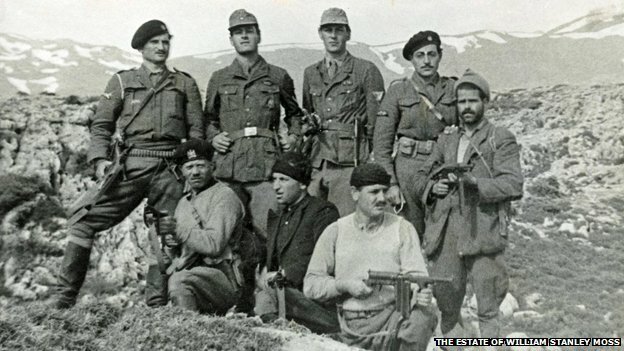 And later in the journey he fell in love with a Romanian princess, Balasha Cantacuzene, tagged along in a royalist cavalry formation deployed against an abortive Greek revolution in 1935 and visited the monasteries of Mount Athos. This six-year “ultimate gap-year”, as the writer Benedict Allen has called it, ended with the outbreak of war in 1939, Fermor’s facility with languages (speaking four fluently with a working knowledge of many more), plus a tried and tested self-sufficiency, meant that he was an ideal candidate for special operations. After the war he stayed on in Greece, worked for the British Council and met his muse, Joan Rayner, who was Wendy to his Peter Pan, as Cooper puts it. An intellectual counter to the polymath Fermor, she was there when, aged 69, he swam the Hellespont in imitation of his idol Lord Byron. The couple married in 1968. She was the unseen presence in works like The Traveller’s Tree, an account of a journey through the geography, history and customs of the Caribbean Islands, and two books about Greece, Mani and Roumeli. He was in his 60s when A Time of Gifts was published, followed 11 years later by Between the Woods and the Water – writing, rewriting and revising so slowly as to drive his publisher Jock Murray to distraction. “I think life always got in the way,” says Cooper. “He felt so unsure of himself in so many ways. He was willing to sponge off friends or live pretty rough, really, until he could get it right. But Fermor was not shackled to travel writing. He became an elegant translator, wrote a proto-magical realist novel, The Violins of Saint-Jacques, and even tried his hand at scriptwriting, co-writing The Roots of Heaven, a Hollywood feature directed by John Huston and starring Errol Flynn. And Fermor became a much sought-after raconteur, famously holding court on his visits to London. Abducting a General: The Kreipe Operation and Soe in Crete by Patrick Leigh Fermor is available to purchase. Click on the highlighted text. This entry was posted in Abducting a General and tagged BBC, Billy Moss, Crete, Ill Met by Moonlight, Patrick Leigh Fermor on October 17, 2014 by proverbs6to10. Wonderfull,a dedicated fan and admirer. Dear Tom , why always linking books to Amazon : what is wrong with Foyles ? Because Amazon provide the most superior customer experience and have the widest range including Kindle which many people opt for.